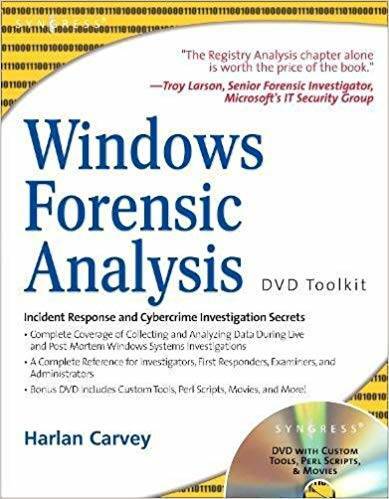 The only book available on the market that addresses and discusses in-depth forensic analysis of Windows systems. Windows Forensic Analysis DVD Toolkit takes the reader to a whole new, undiscovered level of forensic analysis for Windows systems, providing unique information and resources not available anywhere else. This book covers both live and post-mortem response collection and analysis methodologies, addressing material that is applicable to law enforcement, the federal government, students, and consultants. This book also brings this material to the doorstep of system administrators, who are often the front line troops when an incident occurs, but due to staffing and budgets do not have the necessary knowledge to effectively respond. The companion DVD for the book contains significant, unique materials (movies, spreadsheet, code, etc.) not available any place else, as they were created by the author.